All of our stains and sealants are water-based, and while they are still wet, most clean up quite easily with just soap and water. That’s usually the best method to use for cleaning our wet, uncured products off of windows, gutters, downspouts, and other smooth surfaces, but there are occasions when other clean-up techniques should be used to remove some of our textured sealants from wood surfaces. One key for keeping your log home in tip-top condition is to take an hour or so a couple of times a year to inspect the exterior of your home for any signs of potential problems. Remember that a bit of maintenance and small, inexpensive repairs now can prevent expensive repairs later. For the best performance and long lasting beauty, Lifeline™ finishes should only be applied to bare wood surfaces or an existing Lifeline finish that is still in good condition. To remove an existing finish, there are basically three options: pressure washing along with a chemical finish remover, media blasting, and sanding. “Which of your products should I use to seal my log home?” is a question often put to us by prospective customers. Why do so many people refer to “sealing” a log home rather than staining or finishing? Nobody talks about sealing siding or trim on a stick built home. They are either stained or painted, yet sealing is the term used by many log home owners. As it relates to log homes the term “sealing” dates back to the early 1900s. Prior to then, most log homes were constructed using heartwood from old growth timber and left bare. As hot weather approaches, we begin receiving calls about resin bleeding out of logs, and what can be done to stop it. Some people call it sap, or pitch, or resin, but it’s all the same, and short of replacing the log or logs that are bleeding, there is nothing anyone can do to stop it from occurring. 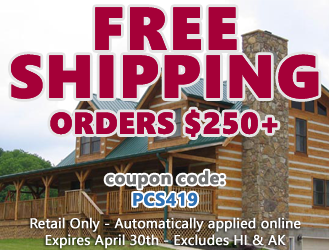 Let us assume that you have a brand new log home, or a home that has had an old finish recently removed. The bare wood is nice and bright, and the color is exactly what you always envisioned for your log home. What's wrong with applying one or two coats of some type of clear sealer to hold the color of the wood and protect your logs from rain, snow, and ultraviolet (UV) light damage? UV Boost™ is a concentrated water-based, liquid stain additive that contains a hindered amine light stabilizer specifically designed for wood protection. Some regions of the country such as the southeast, southwest, and higher altitude areas are subject to high intensity sunlight. Over time, the ultraviolet light in sunlight photo-oxidizes the lignin component of wood. When added to the first coat of any of our Lifeline™ water-based stains, UV Boost interacts with the lignin thus slowing the photo-oxidative rate that results in wood darkening and eventually wood graying beneath the stain. Some of the most challenging discolorations on wood are water stains. They can run the range from light brown to jet black, and can appear on both interior and exterior surfaces. How do water stains form? All wood contains a number of components that are grouped under the category of “water-soluble extractives.” In other words, they can dissolve in water and as the water within the wood evaporates, they can be carried along to the surface. Just as clear coats are vital to the performance of today’s automotive finishes, our Advance™ Topcoats are an integral part of all of our exterior finish systems. Not only do they extend the life of the color coats, but they do much more. Many people do not understand film-forming stains and how they adhere to wood. Much of this misunderstanding relates directly to the term “stain.” In the past, staining wood meant that the wood fibers themselves became impregnated with color and that the color penetrated into the top layer of wood. Even today most oil-based stains work in this manner. Once stained, if the surface is rubbed or scratched, the color of the stain still remains since the solvents carry the colorants into the top layer of wood which make the fibers beneath the surface the color of the stain.